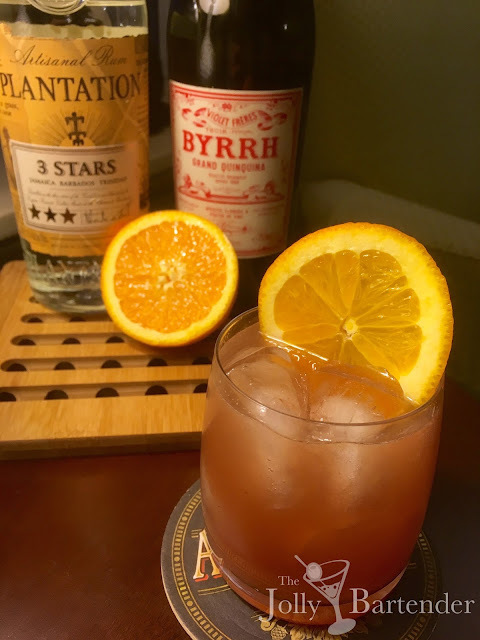 A Florida cocktail needs to represent orange, and this one is no exception. Ripe and juicy naval oranges fresh squeezed and used as a garnish make a big impression. This is a rum drink and very similar to the Florida cocktail I posted a few days earlier. As a side note, the recipe calls for sweet vermouth but I have Byrrh Quinquina, which is pretty much the same thing except it has more quinine and sweet berry and lavender notes as well. What better combination to show off the sunshine state. Combine all ingredients except orange slice in a shaker with ice. Shake and strain into a chilled cocktail glass. Garnish with the orange slice.